The Hinkley Mayflower olde bronze 3 light semi flush ceiling light with amber glass bowl shade is supplied by Elstead Lighting and designed by Hinkley. A bold traditional design finished in dark bronze, with inside etched amber glass. The unique yoke-mount glass holders and decorative cast tension knob detailing add authentic flair. Semi flush mount, with large globe finial and short stem which is ideal for low ceilings. The large glass up-lighter is a soft amber tint with an etched inner. A stunningly exquisite designer creation. 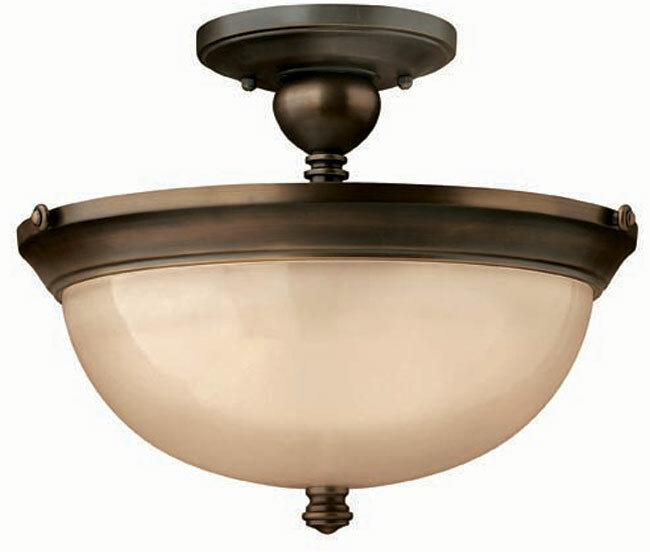 Designed in the USA by Hinkley Lighting, founded in 1922 in Cleveland, Ohio. Their long heritage combines with a pursuit of innovative design to create modern and contemporary lighting like the Mayflower olde bronze 3 light semi flush ceiling light with amber glass bowl shade you see here.